Norman Mailer wrote prolifically, but that didn't mean cranking out insubstantial volumes. The books whose names we all remember always feel, when we take them down off the shelf, somewhat weightier than we remember: Advertisements for Myself at 532 pages, The Naked and the Dead at 731, The Executioner's Song at 1072. But the ones with titles which don't come to mind quite so readily can feel even more physically monumental, and deliberately crafted that way. "Mailer liked to think of his books as his children," wrote Louis Menand in the author's 2007 New Yorker obituary, "and, when asked which were his favorites, to name the least critically appreciated" — he answered, "Ancient Evenings and Harlot’s Ghost, great literary pyramids that no one visits any longer." Ancient Evenings takes place in Egypt, among the actual pyramids, but if you want to visit the much more labyrinthine landmark of Harlot's Ghost, you'd best take a map. Conveniently, Mailer drew one up himself, in the form of the outline above. It would never before have seemed possible to me to reduce Mailer's 1191-page novel of the CIA in the 1960s — a tale of the Mafia, the Cold War, the Cuban Revolution and Missile Crisis, the JFK assassination, and all those events' attendant complications both real and imagined — to a single sheet, but here we have it. You can click on the image at the top of the post to enlarge it, and then click on the section you'd like to read in detail. 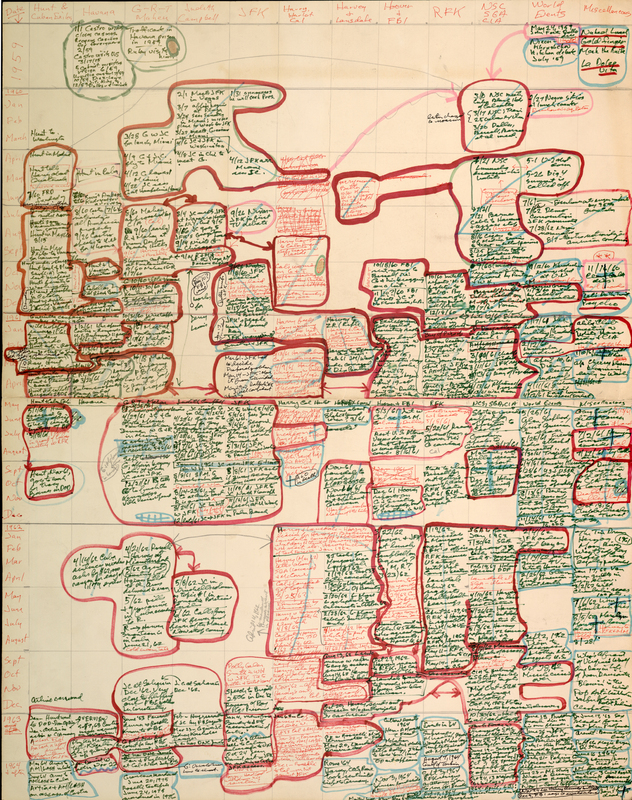 Read Harlot's Ghost with this outline handy, and perhaps you'll find yourself not on the side of those (Menand included) who dismissed the book upon its publication in 1991, but of those who consider it Mailer's masterpiece. Christopher Hitchens took the latter position in his own obituary for Mailer, calling the novel "a historic fictionalizing of the national-security state that came very near to realizing the Balzacian ambition that he had conceived for it. What a shame that it was so dismally received by the critics and that he never delivered the second volume of it that he had promised." And imagine the size and complexity to which Mailer would have grown that book.